Encourage folks to explore the cosmos! 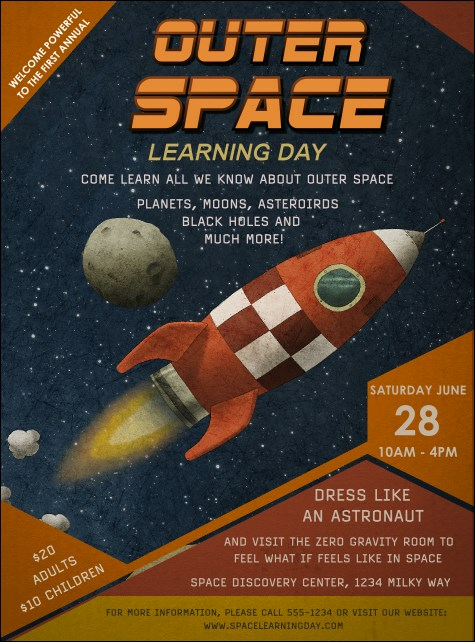 Order a stack of customized, printed Spaceship Flyers to distribute throughout your community. Muted orange and red color blocking frames an outer space scene, atop which your event’s particulars shine like stars. For truly heavenly branding, buddy up with postcards, wristbands, and more from its matching event kit! Browse hundreds of customizable flyers on TicketPrinting.com.